Clemson's first football game this year is a home game vs. Middle Tennessee. The game starts at 6pm (hooray, not a noon game), but it will still most likely be in the 90's during the game - and unless you have high powered fans surrounding your tailgate, you're going to sweat. So the most ideal game day outfit for the first game is a comfortable, cotton dress. Here are some cute, simple dresses (and some shoes!) from a couple of my favorite online clothing sites - and they are all very, very affordable! I love this dress from Forever21.com. I'm convinced that someone who purchases for Forever21 is a Clemson fan - they ALWAYS have dresses that come in orange and purple. I like this dress because it looks comfortable and it looks fitted, but not too fitted - so if you eat too much at your tailgate, you can mask your belly. And pairing it with orange jewelry and orange shoes like the ones above from GoJane.com would be so cute. 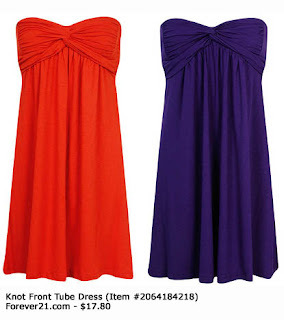 Another dress from Forever21.com, and this one is available in both purple or orange. This dress also looks super comfortable, and hey... no tan lines. :) What I really love, is that it's totally re-wearable if you really wanted to. You can wear it as a dress for the hotter games, then slip on some leggings and wear it when it starts to cool down in the middle of the season. Then, for the October and November games, wear it with skinny jeans and knee high brown boots and a jean jacket or long brown sweater with a brown belt. Another Forever21.com orange dress with a really cute stone halter. I could totally see this dress paired with a really cute pair of brown gladiator sandals. I think either the lighter tan sandal or the darker brown, braided sandal from GoJane.com would work. One thing I love about game days is that it's the only day you can get away with wearing orange with purple. I love mixing the two colors on game days with my outfits. This orange tiered dress from GoJane.com looks really comfortable, and the tiers keep it from being just any ordinary tank dress. However, I think it needs a purple tank top of some kind underneath it to add some color, like the one pictured above from Target. Then finish it all off with a really cute pair of comfortable purple shoes, like these which are also from GoJane.com. I also have seen some cute orange dresses on sale at Belks recently!